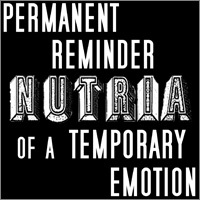 Nutria churn out perfectly-crafted, impossibly catchy rock nʼ roll like Neil Young, The Beatles, Zepellin, and R.E.M. were depending on it. The follow-up to their debut double album release, Metronome/Cheef, the Athens, Georgia bandʼs answer to Big Starʼs classic Radio City/#1 Record, Nutriaʼs new offering, Permanent Reminder of a Temporary Emotion, is an accessible, witty, infectious collection sure to crawl into your head like kudzu. Frontman Bob Spires and co-founder Jay Gonzalez (Drive-By Truckers) are no strangers to pop song greatness. Veterans of fan and industry favorites The Possibilities, the pairʼs former group achieved cult status throughout the indie pop world and saw a laundry list of successes: Opening for R.E.M., Alex Chilton, The Silos, and The High Strung; rocking as Jack Loganʼs backing band; watching the Spires-penned song “You Donʼt Mean It” performed on record and late night television shows by Peter Buck (R.E.M.) and Scott McCaugheyʼs (Young Fresh Fellows) side project, The Minus 5. Permanent Reminder of a Temporary Emotion finds the celebrated songwriters delivering a sophisticated record arguably better than any of their previous work. On PROATE Nutria consists of Bob Spires (lead vocals, electric and acoustic guitars), Jay Gonzalez (keys, electric guitar, backing vocals), Jason Eshelman (drums, backing vocals), and David Weiglein (bass, keys, lap steel, keys, backing vocals). A talented, tight rhythm section, Weiglein and Eshelman both played in the now defunct early 2000s rock group The Eskimos. As Gonzalez stepped away to take over keyboard duties with the Drive-By Truckers, friends and local music forces Andy Pope (bass) and Mark Lawrence (guitar, bass, keys) stepped in to fill in the current line-up of the band. 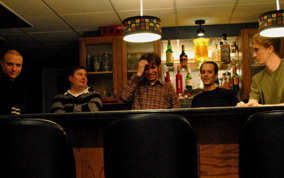 Pope and Lawrence are featured on “Get Your Blank Out” and “In the Water”. And they work, alright. At times melodic and heavy like The Who, elsewhere touching on Led Zeppelin, perhaps suggesting a dirtier Wilco, Nutriaʼs blazes no holds-barred into the new decade with one of the finest rock albums in recent memory. PROATE is graciously littered with sweet harmonies against the fuzz of bass and riff-heavy electric guitars, a Neil Young-Ragged Glory aesthetic running throughout. Spiresʼ signature, charming southern drawl-delivered vignettes are on display from opening rockers “Came to a Halt” and “Element of Surprise” through other highlights- the uneasy symphony of “Straight to Paralyze”, distinctive “Strychnine”, and dreamy closer “In the Water”. PROATE is an upbeat, fun, mature rock nʼ roll trip rooted in classic pop and ready to sweep you away. So join in- youʼll be singing along from the first chorus. And these boys have some ambition. Weiglen adds: “We want to win awards, and have Kanye West come on stage to say someone else should have won.” Until (and after) the Grammyʼs come calling, Nutria will keep doing what they do the best- putting out rock records for the ages. Catchy, fun, perfectly-crafted mature rock n’ roll trip rooted in classic pop and ready to sweep you away, compliments of Athens, Georgia’s finest pop songwriters. An infectious collection sure to crawl into your head like kudzu.